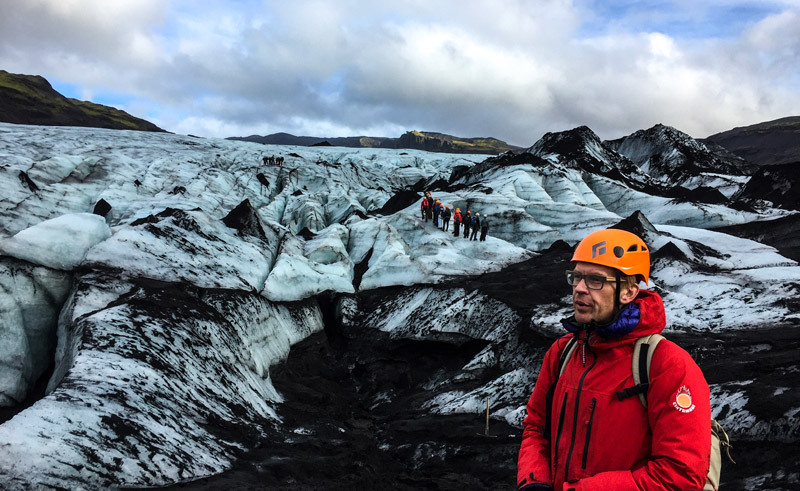 The tour begins at the rugged Solheimajokull Glacier. Solheimajokull is an outlet glacier that flows from the main ice-cap of Myrdalsjokull where the mighty Katla volcano rests. Walk on the glacier, wearing special crampons on your shoes and explore the amazing cracks, crevasses and ice expertly lead by a certified glacier guide. The next destination is the stunning Skogafoss waterfall. Up close, you will be able to feel the water-spray on your face and you can also climb up the hill (all 527 steps) to see the majestic 60 meter high waterfall from above and witness the water plummet down on its way to the Atlantic Ocean. Last but not least, we will visit Seljalandsfoss waterfall that is one of Iceland’s most famous attractions, to get a different perspective you can take a walk from behind and look through the wall of water. All Reykjavik Sightseeing tours include a complimentary bottle of water, USB charging port and a touch screen computer tablet complete with a GPS sensitive unique “In Bus Audio Guide” in every seat. This electronic interactive audio guide provides you with all the information you need to know on each tour in 10 different languages. The tablets can also be used to surf the web, watch videos and more!